Do you ever struggle with anger? Maybe when someone cuts you off or fails to use their turn signal in traffic? You are not alone! A quick Google search for anger management groups gets about 6 million listings! I usually have at least several clients in my practice who struggle with anger and I’ve observed that anger often stems from one of two F words (no, not that F word!). The F words I’m referring to are FEAR and FRUSTRATION. When we have fear or frustration, we often respond with anger. 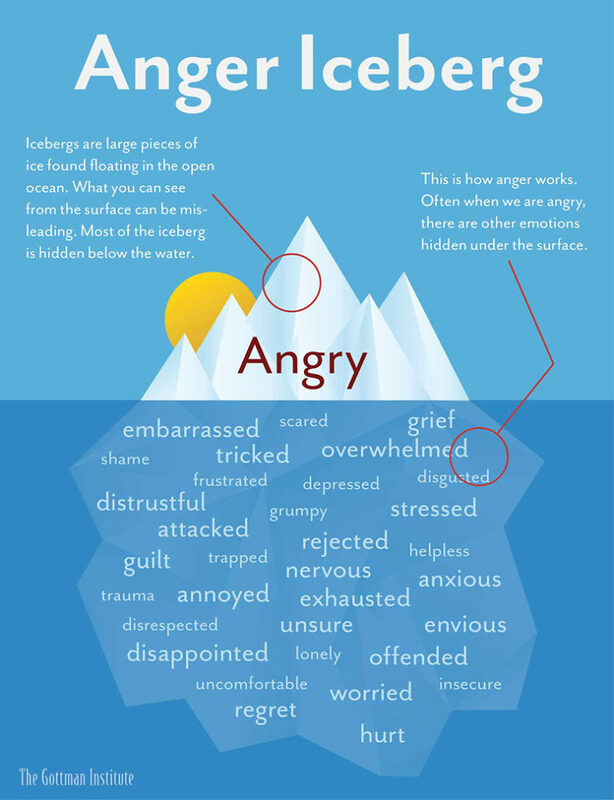 Take a look at this Anger Iceberg from the highly respected Gottman Institute for some more common emotions often hidden under the surface of one’s anger. 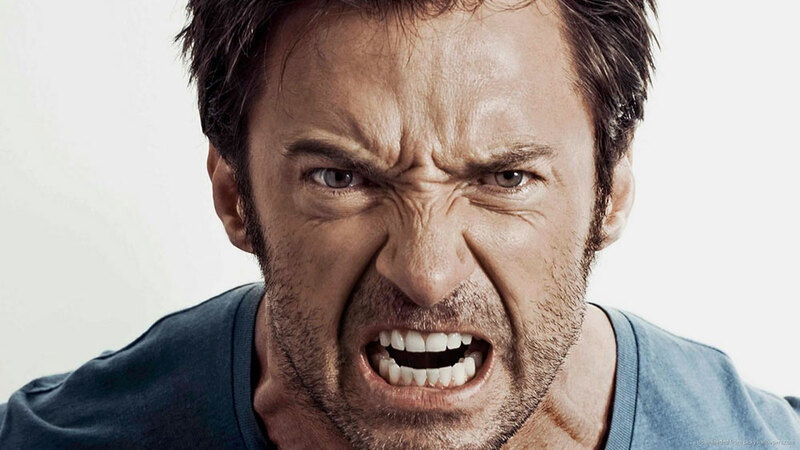 Here are some anger management tips to help you stay calm, cool and collected. 1. 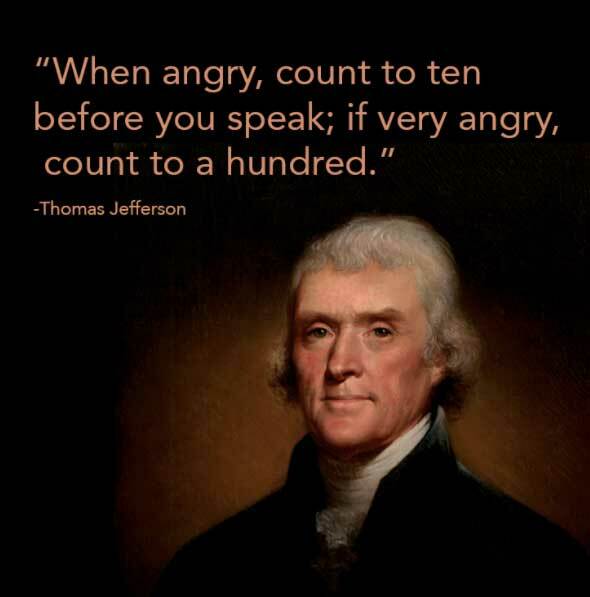 Think Before Speaking–Thomas Jefferson’s advice is full of wisdom. When we speak while angry, we are more likely to say something we later regret. Count to ten (or one hundred if needed) before lashing out in anger. You will be glad you did! 2. Practice Mindful Breathing–Breathing exercises are a great tool to help us stay calm and diffuse anger. I recommend free apps like Stop, Breathe, Think; Calm: or Headspace for guided breathing exercises. Mindful breathing exercises help get the fight or flight system under control. 3. Physical Exercise–When feeling angry in the moment go for a walk or a jog. Or take in a group class like yoga or Brazilian jiu jitsu. By the end of the workout you’ll probably feel a lot better. 4. Press the Pause Button–If you’re getting angry at your spouse or kids, consider taking a brief time out to cool down and reassess the situation before you say something hurtful or that you will regret. Go into a different room, or even step outside for a few minutes before reengaging. 5. Try Forgiveness–Yes, another F word! It has been said that holding on to a grudge is like taking poison and expecting it to kill the other person. Not forgiving is not healthy, so do your best to move towards forgiveness and healing. 6. Get Help If Needed–I once had a client that would throw their cell phone at a wall every time they got angry. When someone has frequent, uncontrollable anger outbursts, they may need more than just self help. Many churches and community centers offer free or low cost anger support groups. There is no shame in your game if you’re trying to be the healthiest version of yourself! Randy is married to Kim and they live in Laguna Niguel. Together they have a blended family of five adult children and three beautiful grandchildren. (If you don’t believe Randy, he will gladly show you pictures! 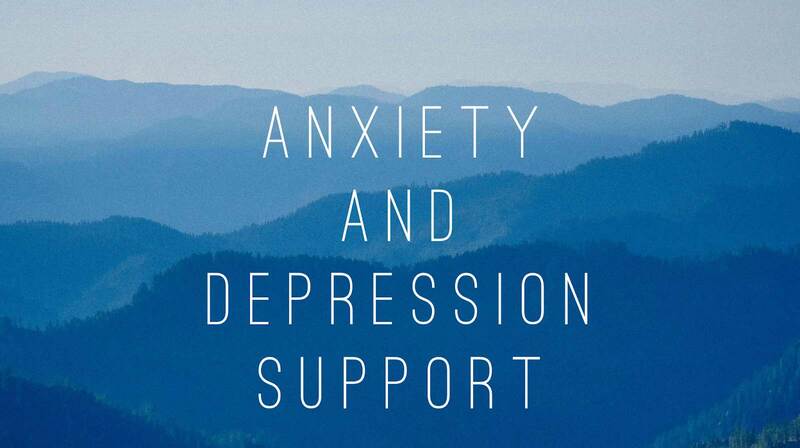 )Randy is a Certified Intervention Professional (CIP) and expert in helping families and individuals affected by addiction and/or mental health issues through counseling, coaching and interventions. He is a Board Certified Pastoral Counselor and is both licensed and ordained as a pastoral counselor. He has five professional coaching certifications and loves working with clients on executive coaching, life coaching, wellness coaching and recovery coaching. Randy has a master’s degree with emphasis in theology and counseling, a bachelors degree in management and leadership, and a certificate in health and fitness with emphasis in exercise physiology and sports psychology from UC Irvine. He has been leading groups, individuals and families to mental, physical and spiritual healthy in Orange County for over 25 years.